How do you feel about selling? All of those feelings are natural. They're human nature and EVERYONE who sells something for a living has felt that way at some point. It can be easy to brush off those feelings - to put them down to just 'not being a natural sales person'. It's easier for those lucky people who were born with the selling gene right? What IS a Natural Sales Person? I mean, what do those lucky few who seem to find selling so easy, have that you don't have? What is it that makes them so un-awkward (is that a word?? ), unafraid, un-annoying (is THAT a word??) and worthy of the sale? It's not genes, I promise you. It's practise. It's going out there, facing those emotions and just getting on with it until it no longer feels so difficult. So it feels uncomfortable? Do it anyway. It's scary? Do it anyway. You feel annoying? You're not. Do it anyway. You don't feel worthy? The only way that's going to change is by proving to yourself that you are. Do it anyway. It's true! Think back to why you set up your business. Yes, you want to be rich and famous and all that jazz - but I don't believe for a second that those are the only reasons. You've got something you want to give to the world right? Something you feel passionate about, that you know you can help people with? The ONLY way you can truly make that impact is by making the sale. Stop thinking of it as being pushy, stop being afraid to hear 'no'. Your customers NEED you to sell to them so they can experience what you have to offer. You're not forcing them - if they don't want it then let them say no. 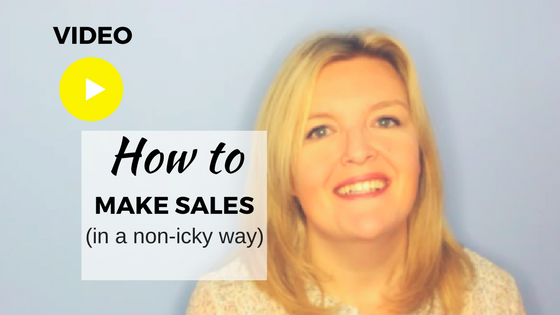 ​In this week's Business Class Monday video, I walk you through some of those mindset blockers and how to overcome them so you too can start making sales - in a non-icky way! For more business tips and tricks to help you leave your 9-5 behind for good, please show my YouTube channel some love and SUBSCRIBE HERE! Then you'll want my Online Business Starter Kit! PSSST! Sign up now and on the next page I'll let you know the 4 biggest mistakes that online business owners make when they're just starting out... so you don't have to.